If you have been following my posts about Moon Dough, you will know how much we love it in our house! Mason was began his collection of Moon Dough toys with the Magic Barnyard and he is absolutely in love with it. Let me introduce the newest product in the Moon Dough line - The Magic Zoo! 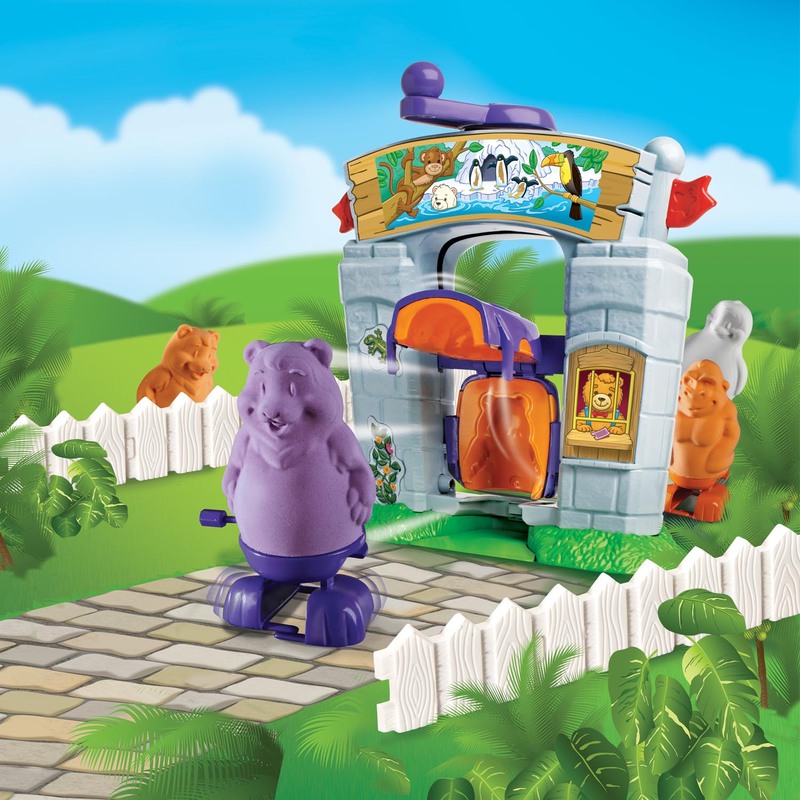 Spin Master has got it right again, and has even stepped it up a notch with walking animals in this playset. First off, set up was a breeze. We started with adding the stickers to the Magical Molding Zoo. Mason is recently into stickers, so right off he was having fun helping me decorate the Zoo. Since Mason recognized the fence mold from the Barnyard playset, we continued creating the Zoo by fencing in the animals. I assembled the Magic Cage, snapped the rest of the pieces together, and chose our first animal mold. We "prepared" the Moon Dough and we ready to create our very own Zoo. We molded the Gorilla first. I helped Mason fill the mold with Moon Dough and closed the cage. He chose which winder walker he wanted to use and I showed him how to snap it in place. We cranked the handle on top of the Molding Zoo until the cage popped open and the Gorilla walked down the ramp. Mason giggled and giggled and screamed, "MORE!" We made Penguins and Bears too to complete our Zoo. Besides the fact that the Magic Zoo is so much fun, one thing we noticed right away is that this toy DOES NOT require batteries. What a pleasant change of pace! You will be able to play with this toy anytime and not worry about the batteries running out in the middle of your child's creative moments. The Moon Dough Magic Zoo retails for $19.99 and it includes 1 Magical Molding Zoo, 1 Penguin Mold, 1 Gorilla Mold, 1 Bear Mold, 1 Fence Mold, 1 Magic Cage, 2 Winder Walkers, 1 Sticker Sheet, 3 Packs of Colored Moon Dough (White, Purple, and Orange), and an Instruction Guide. Don't forget to check out spinmaster.com for the full line of Moon Dough products, as well as, other Spin Master products including Bakugan, Zoobles, Pop On Pals and more! Spin Master provided me with the product above in order to facilitate this review. All opinions are 100% mine. I found a cute link on Parents.com for printable Valentine's Day cards. These are especially good for little ones that are still working on their coloring skills. All you have to do is print, cut out, help your little one add a special message, and sign their name. You have an instant Valentine's Day card ready to go! In my never ending search for legitimate ways to extra cash while staying at home with Mason, I have stumbled across a site called Hits4Pay. I had never heard of this site before, so I decided to check it out. According to the website, Hits4Pay is one of very few highest paying advertising program in the industry. Ok, so I wanted to find out how this works...exactly. Hits4Pay is a very simple program actually. You sign up for a free account, pick 15 categories that interest that you so they can send you emails to view, then wait for the emails to come to your new account. You may also choose to simply login to your Hits4Pay account, and click on Internal Mailbox to check for new paid emails. To get credit for the ads sent to your internal mailbox, you may click on the button or link on the ad that will read "Click Here", or something similar. You will then be taken to the advertiser's website. There will be a Hits4Pay banner above the website. You must remain on the advertiser's website for at least 60 seconds in order to receive $0.02 credit. After 60 seconds, an orange button that says Click Here to View Next Advertisement will appear on the Hits4Pay banner above the website. You must click on this button to receive your $0.02 credit! You may receive anywhere from 0 - 10 paid emails per day. Hits4Pay does not guarantee any Hits4Pay member a certain number of emails they may receive per day. You will receive emails based on how many ads Hits4Pay have sent per day, and the interest categories you have selected. Therefore, you may try selecting more interest categories, or selecting different ones. You will receive payment whenever your account reaches a minimum balance of $25.00. In order to be eligible for payment, you must submit a valid W-9 tax form and make sure your Hits4Pay account includes your valid PayPal address. NOT- an employment opportunity or a get-rich-quick scheme to make money. a way to earn some extra cash by viewing email ads from their advertisers. I completely agree with the above statements. I do like this program very much and will continue with it. I signed up for this program about a week ago and it is legit. I have not received any spam emails from them or anything scammy. What I really like about this program is that you will receive only an occasional message to the email address on your Hits4Pay.com site letting you know that you have ads to view in your internal mailbox on the Hits4pay.com account. There is no junk mail or tons of mail clogging up your personal email every time an ad becomes available. I sign in once a day and check the mailbox. It is very simple. Above, are my stats since I signed up. Right now, Hits4Pay is running a promotion that if you sign up and create your free account today, you will automatically be credited with $10.00 in your account to start you off. That's $10.00 more than I had before I signed up and I think that's a pretty good deal. So, go ahead and check it out!